Home Advance Tax Income Tax What is Advance Tax in India and Due dates of Advance Tax. Advance tax is a part of your annual taxes. Advance Tax is paying some part of your annual taxes in advance of the annual deadline. Tax is paid in advance when the liability of advance tax is Rs.10, 000 or more. This scheme of advance payment of tax is also called pay as you earn scheme, i.e., pay tax as you earn income. Advance tax is paid by the all persons, both corporate assessee (company assessee) and non-corporate assessee (other than non-corporate assessee). If you are a salaried employee, you do not need to pay Advance Tax. Advance tax is applicable when an individual has sources of income other than his/her salary. For instance, if one is earning through capital gains, interest on investments, lottery, house property or business, the concept becomes relevant. 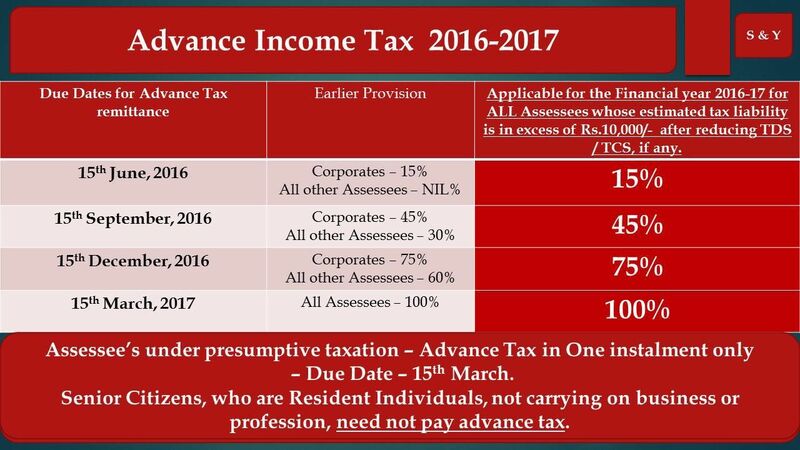 The advance tax is paid in the previous year itself. Thus, the tax is paid in the year of earning of income, in other words the earning of income and payment of tax goes simultaneously. Advance tax is payable on all types of income, including capital gain and winning of lotteries, crossword puzzles etc. however, it is not possible for an assessee to estimate his capital gain or winnings from lotteries. Which are generally unexpected. Therefore in such cases it is provided that if any such income arises after the due date of any installment, then the entire amount of tax payable on such capital gain or casual income should be paid in remaining installments of advance tax which are due or where no such installment is due by 31st march of the relevant financial year. If the entire amount of tax payable is so paid, then no interest on late payment will be livable. Activity A: State whether Mr. X is liable to pay advance tax and if yes then what amount should be paid by what date. The income of Mr. X is Rs. 2, 00,000. Since Mr. X is a non-corporate assessee therefore, the first installment will be due on 15th September. If advance tax is not paid or paid less than 90% of the assessed tax, the assessee shall be liable to payable to pay simple interest @ 1% per month from first day of April following the financial year. If the tax payer does not make payment of advance tax voluntarily, the assessing officer can issue a notice at any time during the financial year, but not later than the last day of February asking him to pay the advance tax in specified instalments. Such notice is ordinarily based on the assessed income of the tax payer for the latest year. The assessee in that case has an option to pay advance tax on the basis of his own estimate if he considers that his current income during the relevant accounting period would be less than the income on the basis of which advance tax has been demanded from him. The assessing officer can modify his notice of demand in certain circumstances. Similarly, the assessee can also revise his estimate any number of times and after adjusting the amount already paid, if any, pay the balance in instalments falling due after the revised estimate. Delay in furnishing the return attacts charge of interest at the rate of 1.5 percent, for every month or part of a month for the period of dealy on the amount of tax found due on the proceesing of return or on regular assessment (refer para 13.6) after giving credit for advance tax and tax deducted at source. In case of failure to file the return such interest is to be calcuted upto the date of best judgement assessment under sec.144. Default in making payment as per the instalment plan mentioned in para 13.2 attracts conequence in the form of charge of interest for deferment at the rate of 1.5% per month for 3 months on the amount of shortfall from the required percentage in the instalments due on 15th June, 15th September and 15th December. If the advance tax paid upto the last instalment, i.e. 15th March falls short of the tax payable as per the return of income, interest @ 1.5% is payable on the amount of shortfall calculated from the date. In case of failure to pay the advance tax or in case of shortfall in such payment in relation to 90% of the assessed tax, a further interest at the rate of 1.5 percent per month of part of month is chargeable from First April of the assessment year to the date of processing of return or the regular assessment on the amount falling short of the assessed tax. 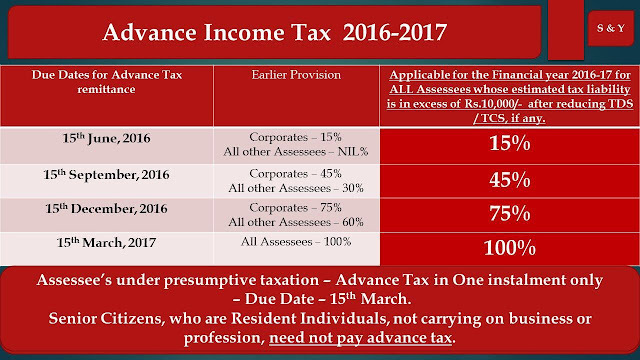 The whole of advance tax is paid by 15th March by both corporate and non-corporate assessee. Advance tax can be paid online through the website of income tax department. It can also be paid by filling challan, ITNS 280 and submitting it at designated branches of specified banks. SBI, Corporation bank and ICICI are some of the banks that accept advance tax payments. Bulk return filing for corporate and Cas | File return for all company employees , Online income tax return filing for mutiple employees at once. TaxRaahi serves several corporates and Cas in offering bulk return filing service.